Struggling to think of the perfect Christmas gift for a friend or family member this year? Well, if they have an iPhone or iPad, we've got you covered with our run-down of the best Christmas gifts for Apple device owners. iPhones and iPads are expensive bits of tech, so it's always worth protecting them, and cases are a cheap yet very effective gift – is there anything better than giving the gift of a non-smashed screen? 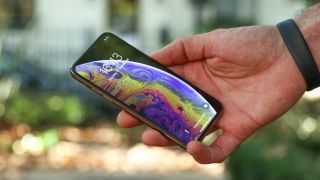 We've rounded up the best cases on offer for a range of iPhones and iPads, from the latest iPhone XS, iPhone XS Max and iPhone XR models, to older handsets and slates that many still own, so click the link in the box that's relevant to you. In our iPhone cases round ups you'll find a variety of styles, shapes and price points to suit all needs - whether you're looking for simple, stylish protection, or rugged, all-action security. Not all selfie sticks are built equal. Sure, you can find them for less than half the price of the CliqueFie online, but are they going to be as good? In some cases perhaps, but CliqueFie has the backing of Apple itself, and this telescopic stick reduces to a pocket-friendly size and features a fully adjustable mount that supports Apple's standard, Plus and SE iPhone variants. There's a remote for snapping pics too, meaning you don't have to reach up to your iPhone's screen to take a image. Beasts of Balance fuses evolution with Jenga skills in a battle of mutational dominance. Easy to learn, but devilishly difficult to master, this isn't just a game for the kids. You can bring the plastic model animals to life via the accompanying app for iPhone and iPad, which also keeps track of the different beasts you create. We had great fun going head-to-head to see who could create the most beasts, and it's something that will go down a treat once all the turkey has gone. Get past its slightly smirk-inducing name, and you'll find the Apple Pencil is great to use – although it's only compatible with the 2015 (Pro 12.9), 2016 (Pro 9.7) and 2017 (Pro 12.9 and Pro 10.5) iPad Pro slates. For the new iPad Pro 11 and iPad Pro 12.9 (2018) you'll need to see the second generation Apple Pencil below. Results using the Pencil are rather good (the latency when taking notes is great), although it's not quite the same as the feel of writing using traditional implements. For those who like to take quick notes and/or sketch on their iPad though, there really is no better tool than the Pencil. If the person you're present hunting for is lucky enough to already own the new iPad 9.7, iPad Pro 11 or iPad Pro 12.9 (2018), then the new Apple Pencil is a great gift. It's got a new, squarer design, a magnetic body allowing it to cling to the side of slate, wireless charging and gesture controls, making it more practical and easy to use. In terms of gesture controls, you're able to simply switch tools by tapping the side of the new Pencil. Plus, you can customize your own gestures, which should come in handy when using non-Apple drawing apps. Know any Star Wars fans with an iPhone or iPad? Then they'll love this R2-D2 droid, complete with pop-out third leg and full remote control via the Sphero app. R2-D2 is an impressive connected toy and one that comes more to life the more droids you have, interactivity that will only improve over time. But even on his own, he's still a lot of fun. Sit down to watch your favorite Star Wars film and R2 will watch with you, beeping his approval at certain scenes. Own an Apple Watch? Then you can also control him from your wrist. LifePrint can print photos and videos from your iPhone's Live Photos gallery, Snapchat, Vine, Twitter, Facebook, Instagram, GoPro videos and more. While the printouts themselves are still images, you can fire up the Lifeprint app on your iPhone or iPad and move it over an image to play an embedded video. The images also have a sticky back, allowing you to stick the photos pretty much anywhere you like. Their look may be controversial, but there's no arguing that Apple's AirPods are astonishingly easy to pair, use and pack away in their charging case. These truly wireless ear buds may be tiny, but they pack a decent audio punch, with superb sound quality delivered through a now-iconic Apple design. Another bonus is the battery life, with the AirPods capable of five hours of playback from a single charge – and pop them into their case and they'll use the internal battery in that to charge up again, keeping you away from a wall plug for longer. MekaMon Robots take battling to a whole new level. Not only were we wowed by the robotic brilliance of the MekaMons themselves – their spider-like legs see them walk in a wonderfully creepy fashion – we also liked the AR experience you can have using your Apple device. We'd recommend using the iPad, utilizing its big screen to get the most from your MekaMon Robot as it dances around the floor firing virtual missiles. The Mekamon is at its most satisfying if you’ve got two that can fight each other, but that will mean shelling out close to $600/£600 for the pleasure. Wearables are hot property these days, and while the Apple Watch 3 may not be the latest smartwatch from Apple (that's the Apple Watch 4), it's new, lower price makes it a great Christmas gift for someone special. There's a lot to love on this watch, from the clear, bright OLED screen and improved fitness smarts to the easy-to-change straps and wealth of apps available. The big addition on the Watch 3 is LTE capabilities, allowing you to leave your phone at home and still make and receive calls, send iMessages and get online. The DJI Spark is the firm's most approachable drone, with intuitive gesture controls, a compact frame and a low-enough price to compete with other affordable quadcopters. From the PalmControl to Quickshots and deeper smartphone integration, DJI has broken down multiple barriers to entry that can make drones seem intimidating. If you head over to Apple, you can bag yourself the exclusive DJI Spark Drone Fly More Combo for $599.95/£629, which includes the Spark drone, extra propellers, an extra battery, a storage box and a shoulder bag.